The mobile payments industry is expected to top $171 billion in 2012, and dozens of players want in. Are they ready for everyday users yet? I left behind my wallet for a day and went shopping. Google's software has limited support right now. It requires an NFC chip -- a technology that's coming soon in many smartphones but currently available in fairly few. The list of devices that can run it includes just a handful of Sprint (S) and Virgin Mobile phones, plus Google's Nexus tablet and Galaxy Nexus phone. 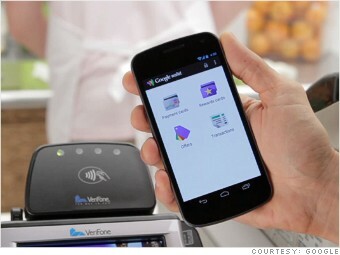 I tested Google Wallet out on a Sprint Galaxy 3. Set-up was pretty easy: It took me about five minutes to create a PIN number and enter my card information into the app. For my test-drive I went to Duane Reade, one of 25 national retailers that supports Google Wallet. It took me a few tries to actually get the service working. You have to open up the app and select which card on file you'd like to pay with. Next step: tapping the phone against the terminal. I got this wrong twice -- I was tapping the front of the phone (the screen displaying my card info) against the terminal, when I should have been tapping the back of the phone. Not exactly intuitive. The process took a bit more time than I'd expected, but I can see where it would come in handy. Google's app includes Google Offers, which dangles deals at places you may be shopping. You can redeem those deals using the app -- no coupons needed -- and the service has a loyalty program built in. What if you lose your phone? Google (GOOG) built in a few safeguards, including the PIN that's required to open the app. The software's cloud connections let you shut Google Wallet off from the Web if your phone disappears.